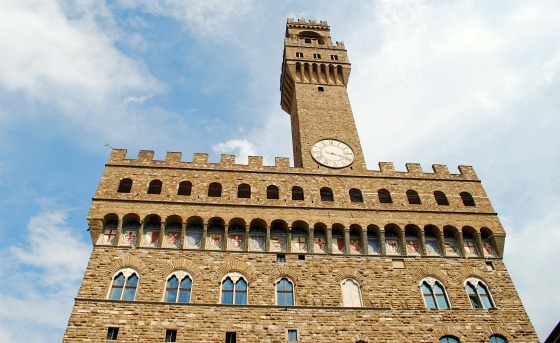 Palazzo Vecchio – This building in Piazza della Signoria is a cross between a castle and palace. 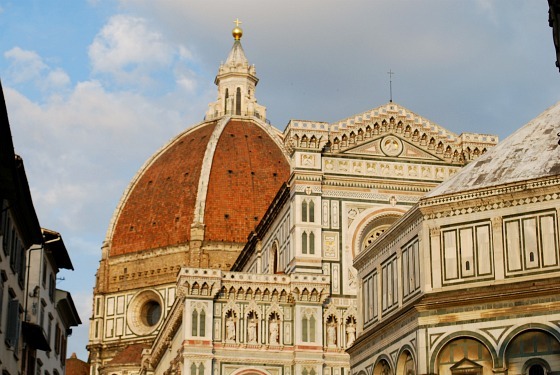 It was constructed as the palace of the ruling Medici dynasty but is still used today as the town hall – the seat of government for Florence. Although there is a museum here, it was the building itself we fell in love with. The huge ballroom, the fascinating map room, and the private chapel are all part of a visit. You get to see more of the building by taking a guided tour which allows you access to the roof walkway too for some terrific views of Florence. Ponte Vecchio – The world’s most famous shop-lined bridge is a Mecca of activity day and night in Florence. 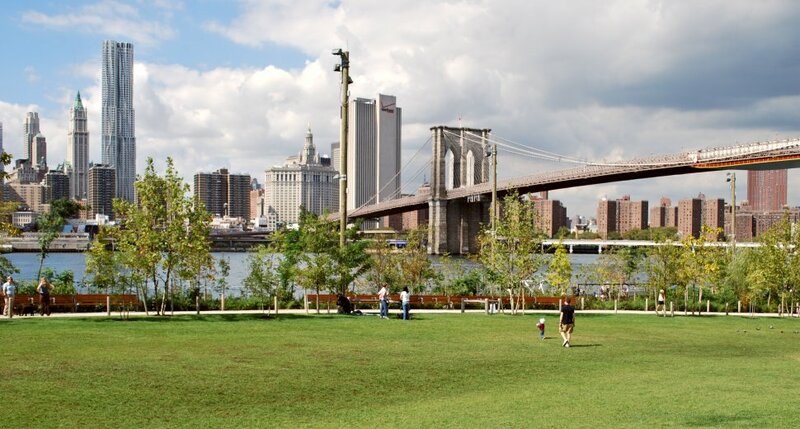 It won’t take you long to walk across it, but pause in the middle to enjoy the view up and down the river. The bridge dates back to the 1300s, but the original butchers shops were replaced with the jewellers that you see today in the 16th century. It’s said that this was because the ruling Medici at the time could not stand the smell when he was using the Vasari Corridor above the shops! Not everyone finds this bridge attractive, but we thought it was lovely and we really liked the hustle and bustle. 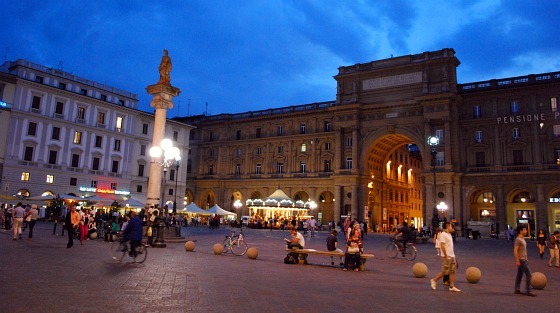 Piazza della Signoria – This is one of Florence’s largest public open spaces and it has a combination of functions. It’s used for dining with eateries spilling into the piazza, for official ceremonies as it’s right by the Town Hall, and also as a sort of public sculpture gallery. Directly by the Town Hall steps you’ll find a replica of Michelangelo’s ‘David’ – this was the location for the original statue which has now been moved to Galleria dell’Accademia. Most of the other sculptures are found under the 14th century canopy known as Loggia dei Lanzi, which is also a public seating area. Florence Food Market (Mercato Centrale) – No trip to Florence would be complete without enjoying the Tuscan food in the many restaurants, trattorias or osterias. 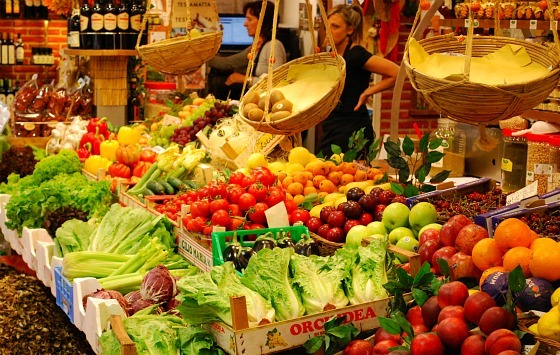 You can also experience the best of the food on offer in the city though at the indoor food market on Via Dell’Ariento. 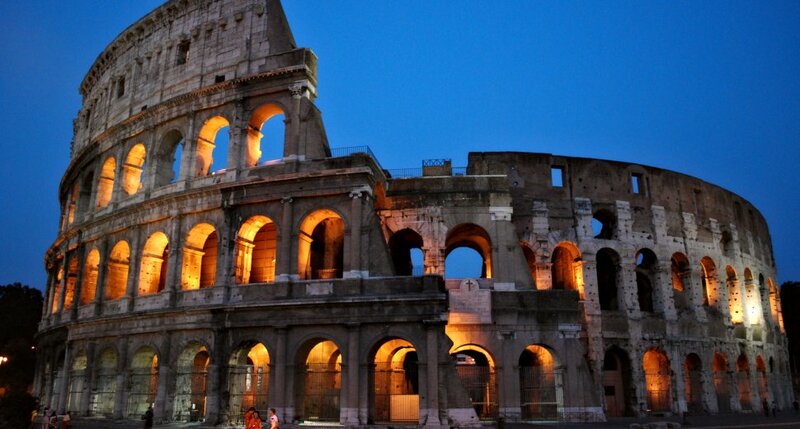 Inside you’ll find specialist outlets selling the best in Italian meats, cheeses, olives, vegetables, fruits and spices. Best of all, you’ll find lots of free samples on offer too! We loved the smells, the atmosphere and especially the obvious pride that the stall-holders have in their produce. 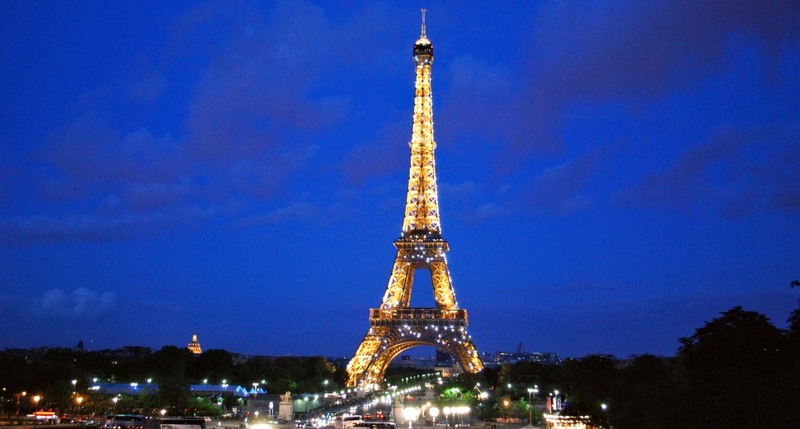 The best time to go is before 10am because at peak times of the day, the crowds start to clog up the aisles. 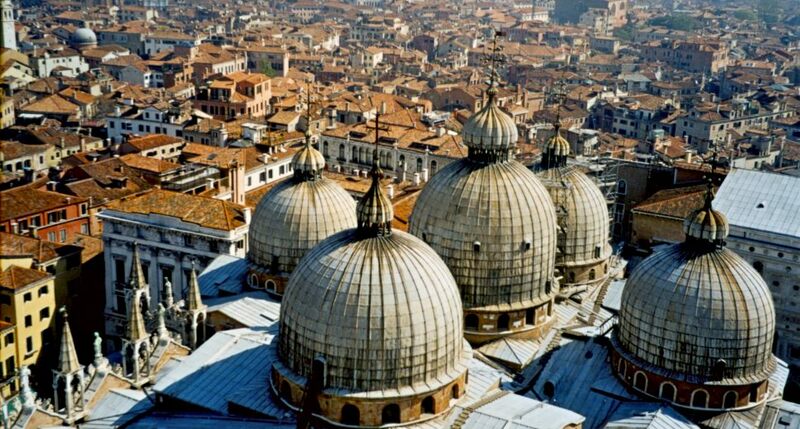 Santa Croce – This cathedral contains the tombs of two artistic greats – Michelangelo and Galileo. The cathedral itself is really attractive with huge canvas paintings on both main walls, plus some fabulously decorated chapels. 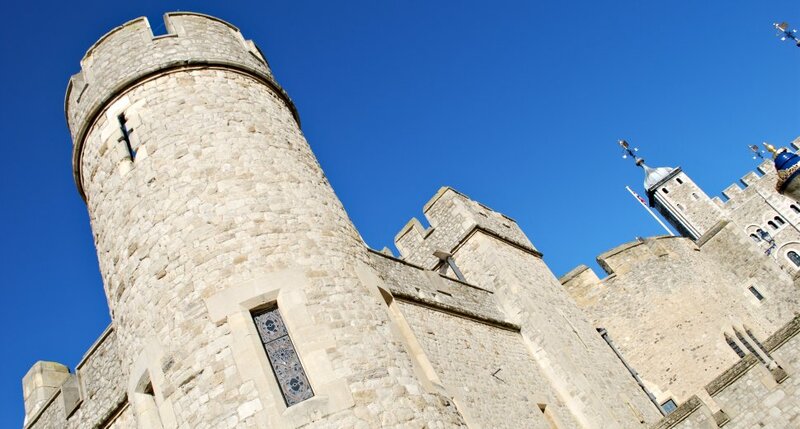 Your entry fee also covers the cloisters, a really pretty Renaissance chapel, and a museum. If you haven’t got time to enter Santa Croce, we’d still recommend calling by to see the marble frontage of the church and the Piazza di Santa Croce which is lined with bars and trattorias. Uffizi Gallery – Some travel guides would make a big fuss of this incredible museum and say it’s the top place to visit in Florence. 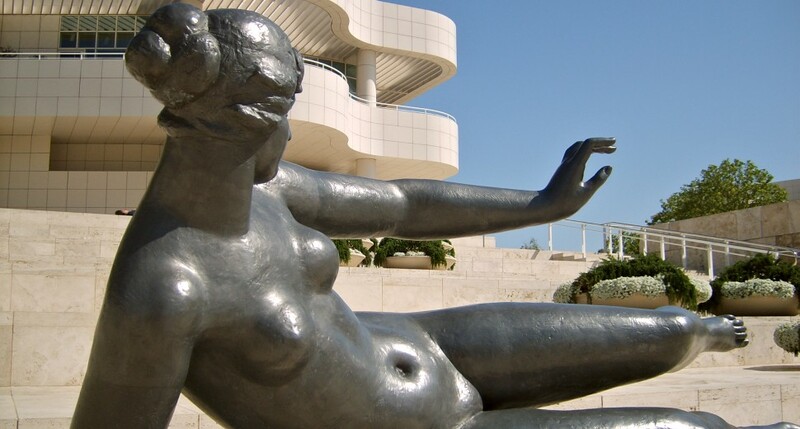 Our philosophy is that you should see the sights of the city itself, before spending hours inside museums! Despite that, there’s no doubt that if you love Renaissance art, this museum is an absolute must. It’s been called the greatest collection of Renaissance art in the world. 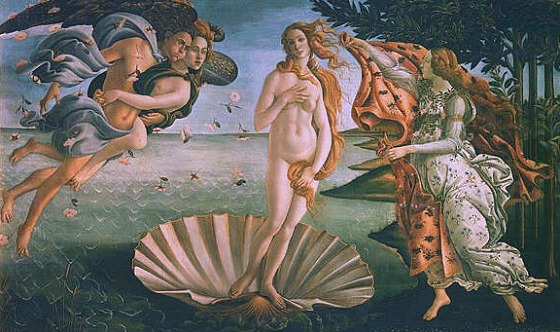 The best works by Botticelli, Leonardo Da Vinci, Giotto, Raphael, Michelangelo and Titan are all here. 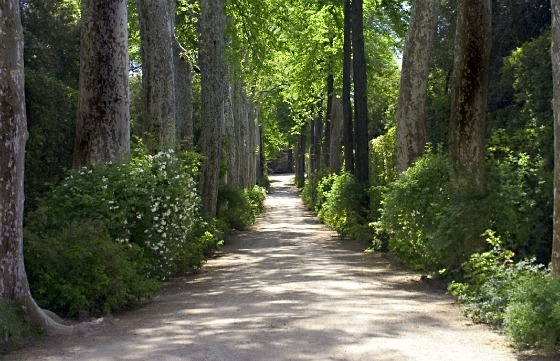 Boboli Gardens – The gardens of the Pitti Palace are a great place to escape the crowds. For us they were the highlight of a visit to the whole palace, but you can buy an admission ticket just for the gardens. 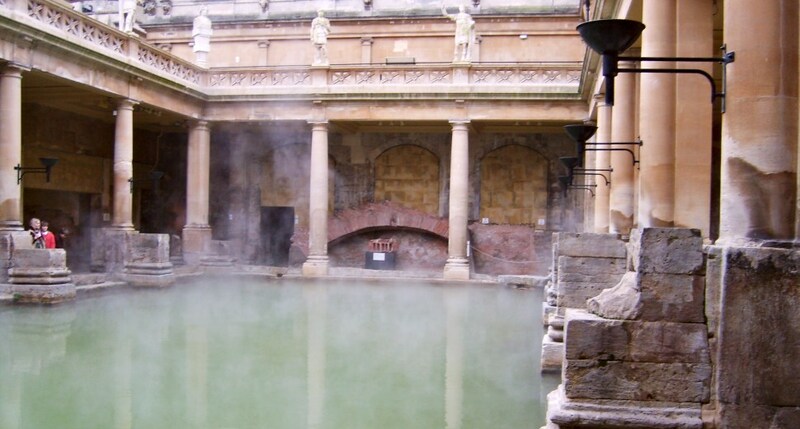 If you love attractive water features, hidden statues, superb floral walkways, and large terracotta pots, then this is the place for you. A perfect classic Italian garden, just a short stroll from the city centre and admission to the gardens includes some areas of Palazzo Pitti. 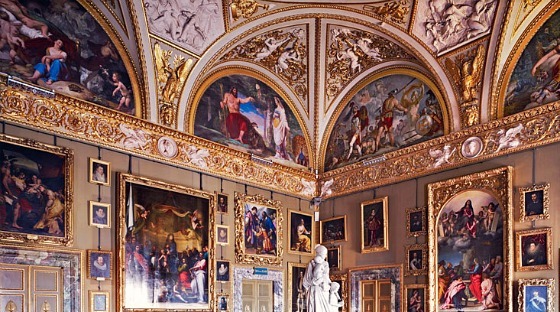 Palazzo Pitti – The Medici family used to live here and this palace demonstrates all the trappings of their wealth. We really liked the Royal Apartments and the Green Room as you could imagine the Medici’s still living there. The palace also acts as a museum collection of art though. Top of the list to see art wise, is probably Raphael’s La Velata, although there are plenty of his other Madonna portraits here too. 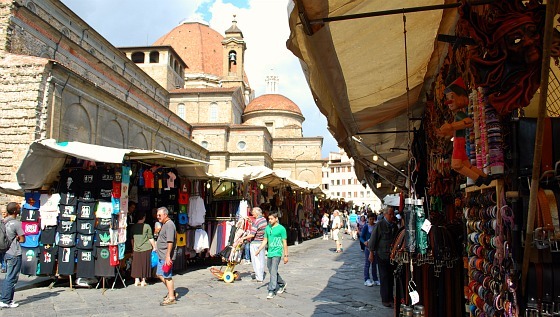 San Lorenzo Street Market – Florence is known for its leather goods and you’ll find plenty of merchandise available in the outdoor San Lorenzo street market. Along with the leather, there are scarves, clothes, souvenirs, ornaments…you name it. The market stretches around the Basilica di San Lorenzo, along Via dell’Ariento and down Via Rossina where you’ll find the indoor food market. It’s open every day except Sunday and is often still selling goods in the evening hours. Piazza della Repubblica – This public square marks the original location of Florence’s Roman forum although everything you see here is much more modern than that! 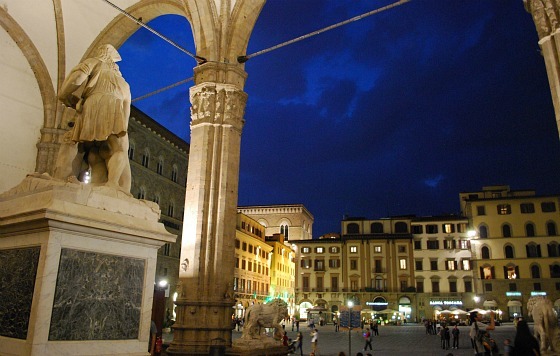 The Column of Abundance (Colonna dell’Abbondanza) in the middle of the piazza marks the traditional centre of the city. There are two striking features of the square today, firstly the huge arch called “Arcone” with its porticos each side and secondly the traditional carousel which gives children gleeful faces whenever it operates. 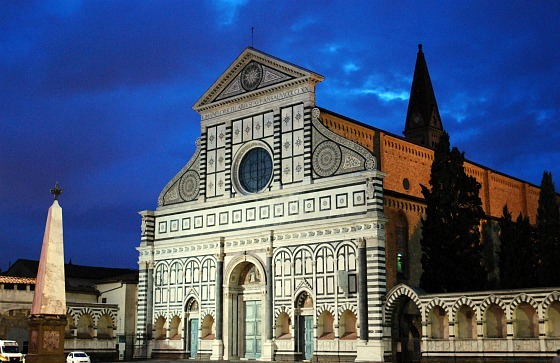 Santa Maria Novella – This is another of Florence’s churches with masterpieces inside and an admission charge, but another that is worth a visit. The frescoes here, particularly in the sanctuary and the cloisters are lovely. Also, if you’ve studied paintings, you may well know that the first one to use perspective was Masaccio’s Trinita. 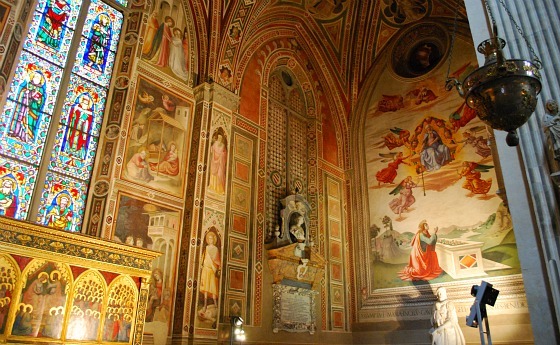 You’ll find the painting inside Santa Maria Novella along with Giotto’s Crucifix. Outside the church, the Pizza Santa Maria Novella is one of Florence’s quieter open spaces and it has modern benches to sit on and ‘people watch’. Piazzale Michelangelo – It’s a bit of a trek to get here on foot, but if you want picture postcard views of Florence, this is the place to come! 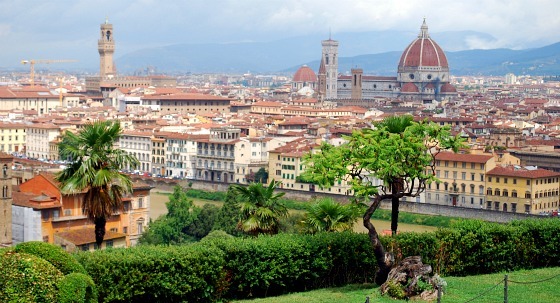 Across the river from the main areas of the city and up a small hill, you’ll find a wide open area for viewing Florence. The route here on foot includes lots of stairs which will zap your energy levels, but the view is well worth it. 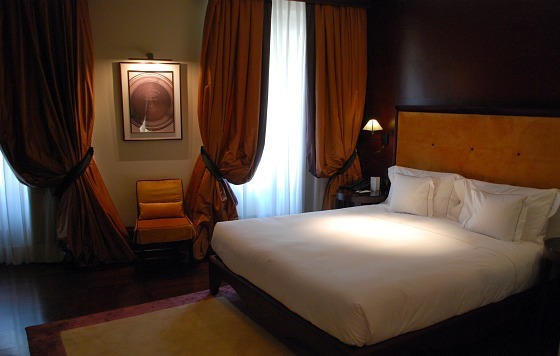 We stayed at the 4 star Hotel L’Orologio in Piazza Santa Maria Novella. We wouldn’t hesitate to recommend this hotel to anyone, in fact we’d say it’s one of the most luxurious hotels we’ve ever stayed in! We had a Superior room and it was absolutely lovely – modern, tasteful furnishings and drapes and a fantastic marble bathroom which made the stand-alone bath a real centrepiece. The location is brilliant too, just a 5 minute walk from the train station and on the doorstep of all the major sights of Florence. Breakfast is in an upstairs room which overlooks the piazza and we thought the quality of the food was very good. In short, whilst it might not be the cheapest place to stay in Florence, it’s a great hotel and we thought it was worth every penny. 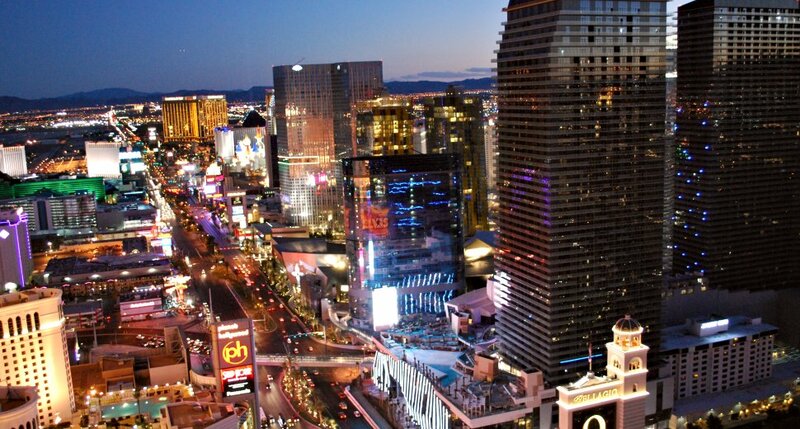 At Hotels.com you can check out reviews from other travellers and get guaranteed lowest prices. Hotel L’Orologio: Secret Pictures, Full Review, Rates & Map..
Florence is compact enough to walk around quite easily and all the main sights are in close proximity to one another. The only thing that is slightly further to walk to is our “top-tip” of Piazzale Michelangelo (see above) and if you’re worried about the climb, we’d recommend the Hop-on, Hop-off Bus Tour as a means to get here.